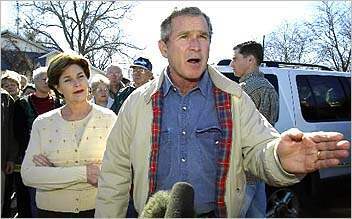 Speaking to reporters near his ranch in Crawford, Texas, Mr Bush drew a sharp distinction between the nuclear crisis in North Korea and his confrontation with Iraq, saying he was certain Pyongyang's weapons projects could be stopped "peacefully, through diplomacy". The Iraqi President, on the other hand, "hasn't heard the message" that he must disarm or face military action. Asked why Americans should be more frightened of Saddam than of North Korea, Mr Bush said: "It's important to remember that Saddam Hussein was close to having nuclear weapons. We don't know whether or not he has a nuclear weapon."